2000AD Comic Prog #503 (3rd January 1987) | 'TAIN'T THE MEAT… IT'S THE HUMANITY! 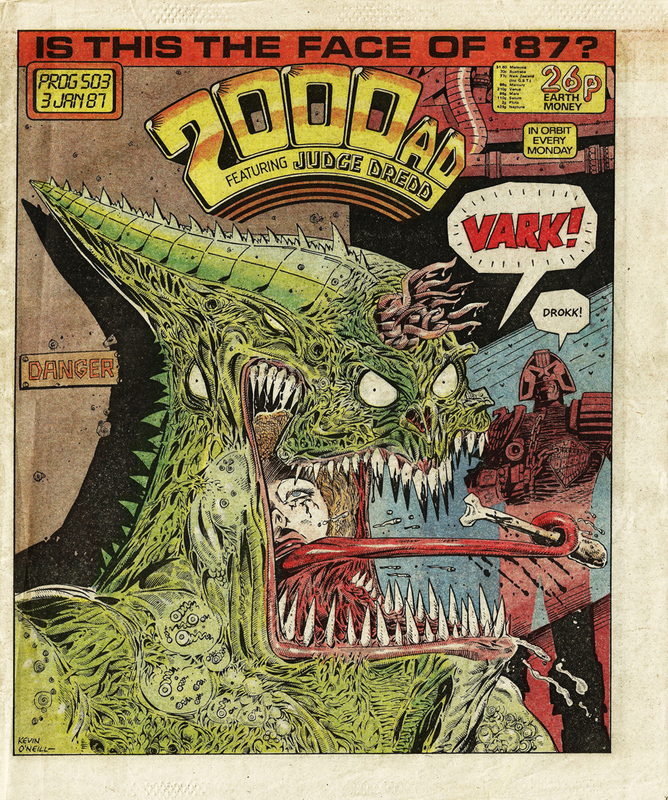 The first issue of 2000AD comic from 1987 featured this charmer on the front cover. Dated 3rd January 1987, Prog #503 of 2000AD, the weekly British sci-fi comic, featured cover artwork by Kevin O’Neill at his manic best. This cover pretty much encapsulates everything I love about O’Neill – it’s creepy, surreal, wonderfully detailed and just damn-right bonkers. The Judge Dredd story the cover promotes (“Vark!’) is also great fun. Written by John Wagner and Alan Grant it concerns a mother’s attempts to protect her sons who have been infected by an alien creature that slowly turns them into blood-thirsty monsters. It’s a fun one-off and the highlight of the issue. Speaking of which, the rest of the Prog is strong and acts as a promising start for the New Year. First up was another instalment of reader favourite Slaine The King, followed by Bad Company. As usual Judge Dredd received the full-colour centre-spread treatment with Nemesis The Warlock following. The inside back cover announced the winner of the Lair and Snares competition while the back cover featured two more letters in the weekly Dredd encyclopaedia, A Mega-City Primer. I’m going to look at a few more classic O’Neill covers for 2000AD comic over the next few weeks. In the meantime, here’s a link to a few I’ve already looked at.